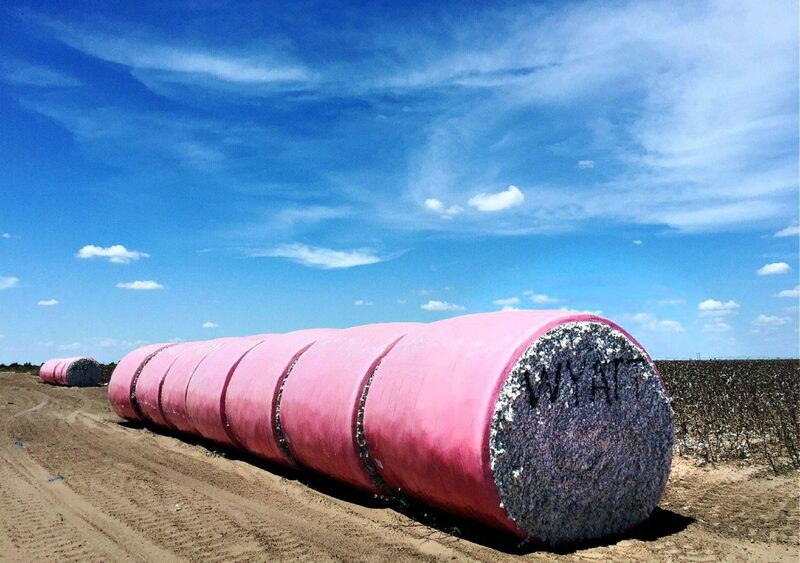 This cotton-growing season was the first time Edinburg-based Wyatt Ranches, which plants cotton in the Rio Grande Valley and the Nueces Strip, wrapped bales in pink plastic to raise awareness about breast and other cancers. Cotton picked in Monte Alto waits to be taken to the gin on Saturday, Sept. 1, 2018. Drivers traveling along East Monte Cristo Road or Farm-to-Market Road 1015 may have spotted an unusual sight along the roadway last month — what, from a distance, resembled a candy-colored marshmallow, a bright pink blob dotting the browns and blues of Hidalgo County’s farmland. The blobs, as Bradford Wyatt refers to them, were actually bales of cotton wrapped in pink plastic waiting to be taken to the gin. The Wyatt Ranches administrator decided to stray from the standard John Deere yellow wrap this cotton season in an effort to raise awareness about cancer. Bales of harvested cotton from a field off Monte Cristo Road east of Edinburg wait to be transported to a local gin on Saturday, Sept. 1, 2018. 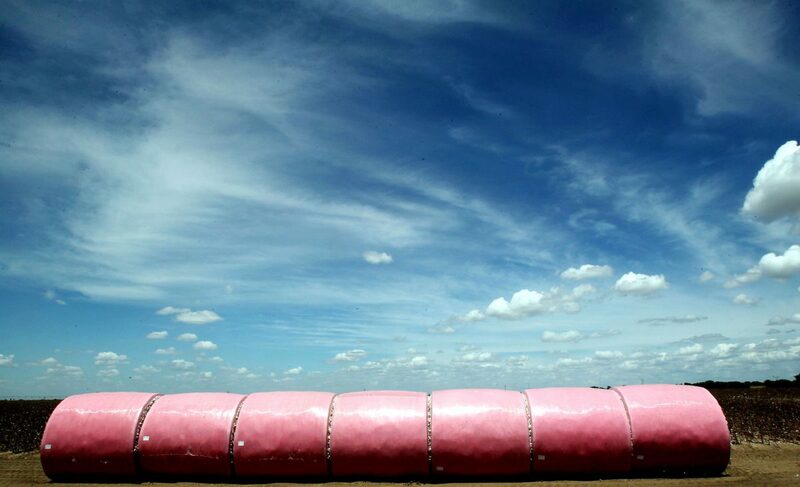 As part of a breast cancer awareness campaign, Wyatt Ranches wrapped its cotton bales in John Deere pink plastic. Since 2014, John Deere suppliers across the nation have sold pink plastic wrap, which is made in the distinct shade identified with the worldwide campaign for October’s Breast Cancer Awareness Month. Breast cancer is the most common cancer in women in the United States, according to the American Cancer Society. The pink wrap resulted from a request by Jason Chandler, a Missouri cotton producer who lost his sister to breast cancer in 2010, and wanted a way to honor her. “It took quite a bit of study to accomplish the color,” said Mike Bieber, the marketing director for Tama USA, who worked with Chandler to develop the wrap, which Israel-based Tama, a crop packaging producer, created for John Deere. 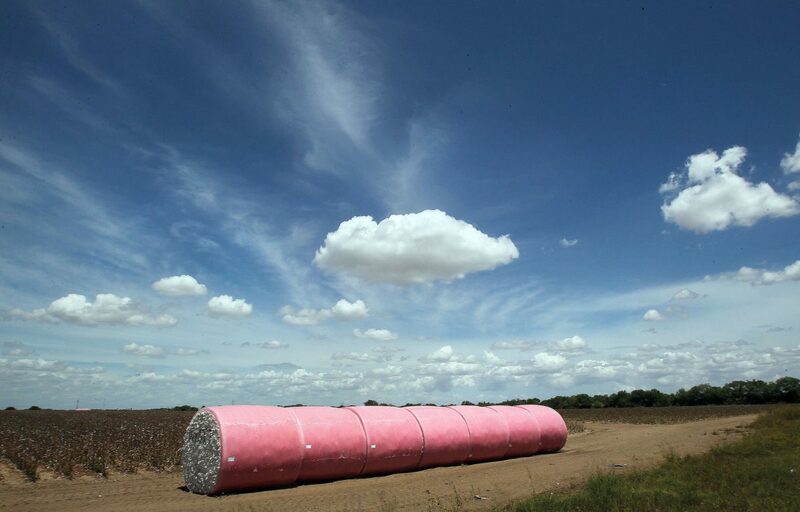 This cotton season was the first time Edinburg-based Wyatt Ranches, which plants cotton in the Rio Grande Valley and the Nueces Strip, wrapped its bales in pink, after local suppliers ordered the color. Wyatt said he plans to continue doing so in future seasons.